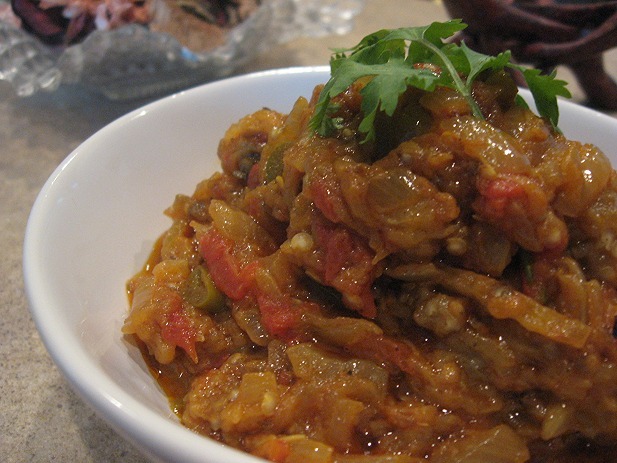 my hubby’s fav….he’s the one who taught me to make this bharta….yours looks fab!!! Hema, nice to discover your blog…Love to try you veg receipes. the pic looks so nice! Any Baingan dish I love!! Looks great. I still prefer south Indian pachadi though! It doesnt take as long if you broil them in the oven. Max 7-8 mts. Try it sometime. Here it is my fav and the only way I can get H to eat brijal. You made my day! I came by your space and saw that you have disabled comments. Was going to send you an email. Enjoy your books! It has been ages since I read one too. Waiting for the little one to grow up some more. Thanks for posting this recipe, Hema! lovely pic of the bharta! interesting read of you culinary journey! Wow I’m SO glad you’re updating your food blog again. My mother LOVES your blog, and her favourite recipe is your yelai vada… she’s made it so many times for us (my sister, me and my bro)! 🙂 Hope to see lots more recipes from you now! You mentioned holding the eggplant directly to the fire … do you suggest using a metal tong? The thing I’m concerned about is, if it takes too long for the baingan to get cooked, then the tong may become very hot … How long does it take for the baingan to get cooked? fantastic pile of good stuff! You have a very nice blog there. You can keep the eggplant on the fire and let it cook on one side for 3-4 minutes. Turn around with tongs and repeat as required. If the eggplant does not have a good support, you could lay it on a mesh that can sit on the stove. God! This sounds yumm!!! I am going to try this! yummy and mouthwatering recipe. Beautiful picture. Nice recipe. i read in other places to add yogurt, i am a bit confused if i should or not as you have not included it. Please let me know if i need to add yogurt, or what difference does it make to add or not add yogurt?